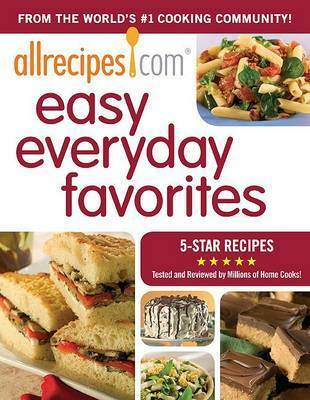 When there's barely time for a homemade meal-much less time for mistakes- millions of home cooks turn to allrecipes.com for reliable, quick, and easy recipes that taste great. 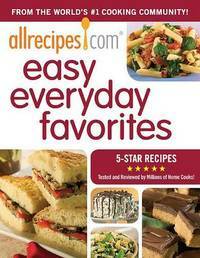 Now they can grab a book filled with only five-star recipes from the site they've come to love. From "Vegetarian Four Cheese Lasagna" to "Bourbon Pecan Chicken," from "Hot Fudge Ice Cream Bar Dessert" to "Crustless Cranberry Pie," the hundreds of recipes for appetizers, entrees, and desserts in this beautifully illustrated book have been tested again and again in kitchens all over the country and include: A complete, detailed list of ingredientsClear, step-by-step instructionsPractical pointers and flavor-boosting tips from home cooksPrep time, cook time, ready timeNumber of servings Nutritional facts such as per-serving calories, total fat, cholesterol, sodium, total carbs, dietary fiber, and protein counts Rated and reviewed by the millions of people who have made these recipes, many are presented alongside mouthwatering full-color photographs that make it easy to find just the right recipe for every occasion. Whether you're a vegetarian or a hearty meat eater, whether you have hours to kill or just enough time for a quick and easy crock-pot meal, you'll find it all in this one convenient cookbook.